An important part of getting your fashion designs produced is having samples made and holding fit sessions. If you’re not familiar with that process, there’s an article on that here. After a fitting, chance are you’ll need to make some changes - they might be big changes, or just tiny ones, but there’s almost always something to change. Therefore, you’ll need to effectively communicate your changes to the factory, so they carry out your change and improve the garment. This post goes through how you can effectively communicate your changes. By giving clear instruction to the factory, you can reduce the number of samples required in total, therefore saving you time and money. Personally, I always keep all updates within the tech pack to keep everything in one place. The last thing you want is for your instructions to be lost in someone’s inbox. A lot of companies I’ve worked with follow this process too, essentially it minimises the amount of backwards and forwards with emails. If you’re tech pack doesn’t come with the layout in the screenshot below, you’ll want to create something like this for yourself. It takes a little time to set up initially, but it’ll save you a lot of time in the long run. When you’re all set up with this in Excel, you can start using it. 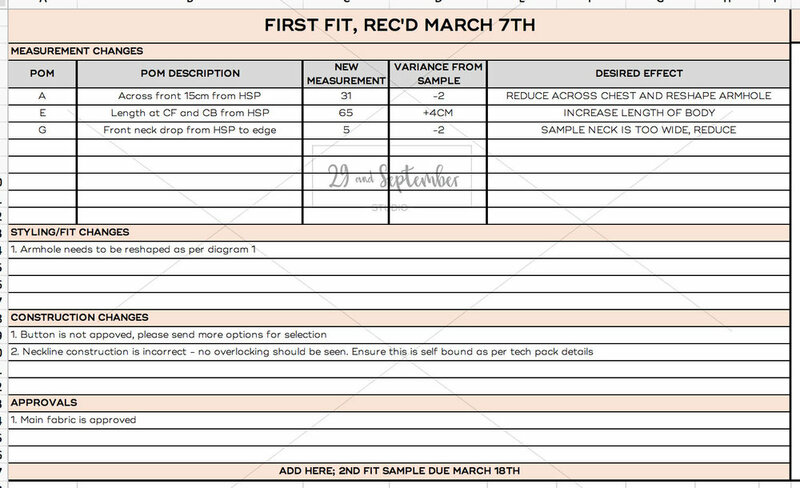 The POMs (points of measure) and original measurements will be the ones that your garment technologist has provided for you, which you can just copy into this table. In the ' +/-', you enter the measurement differences between what you asked for and the sample you've received. Never assume the measurements of the sample are correct - they often aren’t. You’ll then use the ‘amended spec’ column to communicate the measurements for the next sample to the factory. Many of the measurements may be the same, with just a few small changes. If this is a PP Sample and you’re happy with it, you’ll want to enter the measurements into the Final Spec column, so the factory know you’re happy with them. I grey out any of the old measurements, so the factory doesn’t get confused and highlight the ones they should follow in yellow. When I’m happy with my comments, I send on via email, or via a project management tool, depending on who I’m working with and how big the company is. When I send the comments, in the main body of the email/message I include any major issues in bold, to ensure they are addressed and ask the factory to reconfirm to me. This can vary between factories and countries, but as a general rule, if you are working with a factory who's first language isn't English you should be direct and specific, don't leave anything to the imagination. In general, either way, don't write as you would speak, there's no need for lots of extra words. Bullet points work best, so manufacturers can easily see the problems and fix them one by one, rather than having to trawl through a long message in order to find the problems. People are busy and the more extra words there are, the more easily it is for things to get missed. As you can see in my example, comments are short and concise. Particularly for non-English speaking manufacturers, be blunt if need be. It feels strange to most of us being very to the point and simply asking someone to do things better, but with many overseas factories if you're not explicit in what you want and when you want it, they often consider it to be unimportant and things can get missed. If something hasn't been done that should have been and instruction has been ignored, don't be afraid to write in bold and capitals to make sure it won't get missed again - it can take some getting used to, but in my experience it does lead to better results. Don't expect the factory to solve the problems. This is often a point that a lot of new brands struggle with, as they expect the factory to offer all of the solutions. If you have a good factory they can certainly help and make suggestions, but don't forget they are making money from you and may guide you in a direction that is more profitable for them, rather than being best for you. If something is wrong, don't just say fix it. Say what you want to happen. For instance if your fit model is struggling to get something over the hips, but when its on it looks great, don't just say 'garment is hard to get on' say 'zip is 15cm too short, amend in next sample', and add the new zip length to the tech pack. If you change the armhole drop measurement (the distance from the highest shoulder point to under the arm), you need to remember that some other measurements are based on the position of the arm hole, for instance, bust, waist and hip measurements are often 'x amount' of centimetres below the armhole. If for example you make the armhole 4cm lower, then you need to remember to change the measurements so the 'x centimetres below the armhole' is 4cm less. Otherwise, the bust, waist and hips will be measured too low. I hope you’ve found this useful. I appreciate it might be a lot to take in if you’re new to this and it can be really overwhelming if you've not had a fitting before! If you still don't feel confident in completing comments yourself at this stage, I offer coaching online and in person fit session help (in several cities worldwide) and would love to discuss your project further. If this is of interest you can send me a message and I'll get back to you with more information.